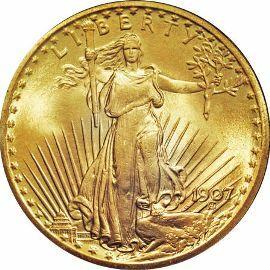 The St Gaudens Double Eagle (no Motto) version is the second variety in this series. It was made at the US Mint in 1907 and 1908. 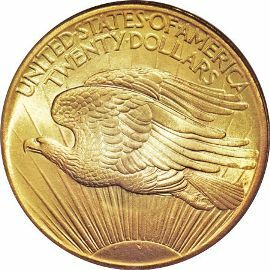 Like its smaller counterpart, the gold eagle, it also lacks the motto "IN GOD WE TRUST". The mint had difficulty producing the earlier high relief issue so the relief of the coin changed to facilitate easier striking. No gold coin collection would be complete without an example of this impressive coin. branch in her left hand and a torch in her right. Liberty is in full stride with the suns rays behind her, the inscription "LIBERTY" is above her and the US Capitol Building to the left of her dress. Encircling her are 46 stars signifying each state in the Union at that time. The date is located on the lower right of the coin within the suns rays. The reverse of this gold coin bears the inscriptions "UNITED STATES OF AMERICA" and "TWENTY DOLLARS" over an eagle soaring up and to the left through the suns rays.